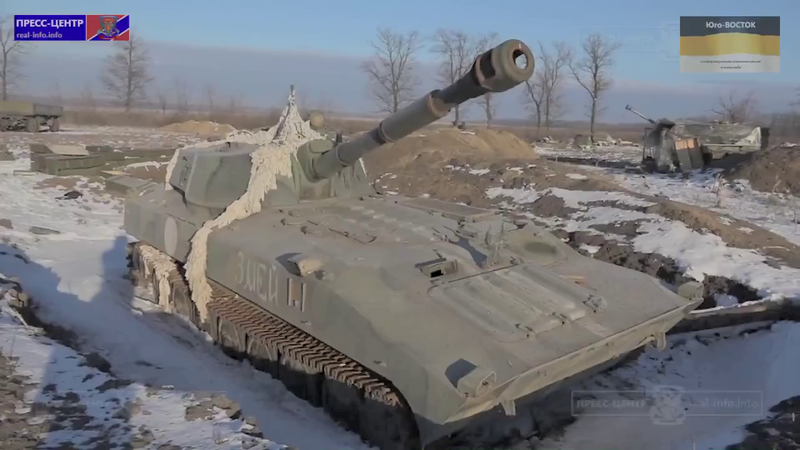 HomeThe End of the Donbass War? 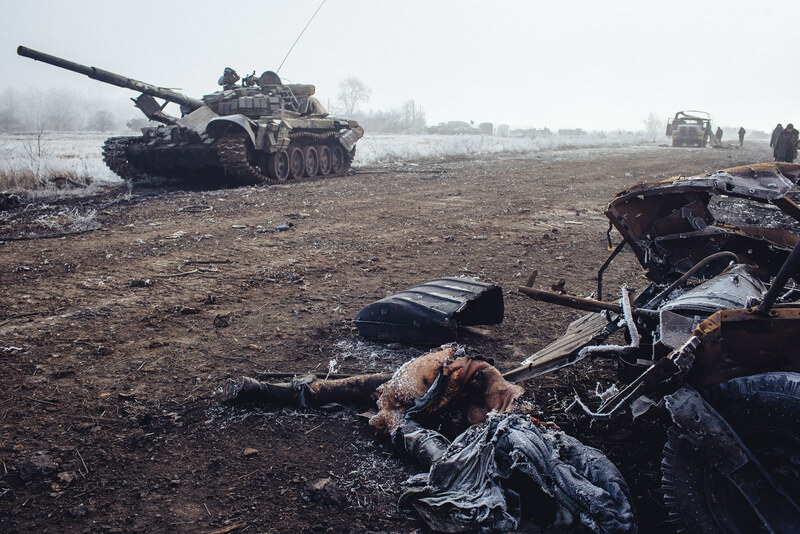 Destroyed Ukraine military vehicle with dead Ukraine soldiers on the outskirts of Debalstseva. This is how it ended. The reaction of the Western media says it all. There is nothing but denial from them regarding the outcome of the War in the Donbass along with the fervent hope that the ceasefire fails and that the Ukraine military will be sent back to face yet another pointless defeat as has happened since the failure of the September ceasefire.Still, if things don’t work out, well they can just make stuff up. The encircled Ukraine troops in Debalstseve have either withdrawn or surrendered en masse today in what the Ukraine President Poroshenko predictably described as a “planned withdrawal”. A lie so silly and childish that to even call it a lie is redundant. Dishonesty is the rule when it comes to Ukraine government communications. 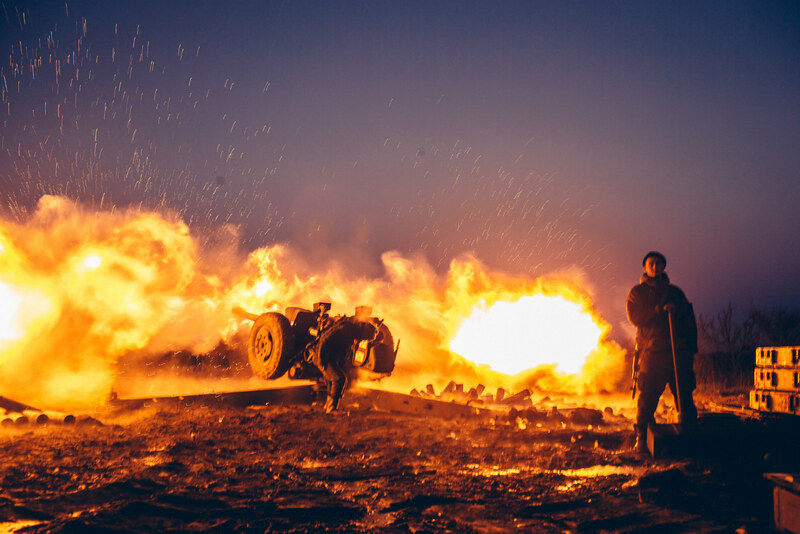 Debaltseve is a key transport hub inside the Donetsk Oblast that sits almost halfway between Donetsk and Luhansk, the other surviving Novorussian “Republic” The large force of Ukraine troops in Debaltseve, as many as 9000 have been slowly surrounded over a series of weeks. A deal regarding their fate could not be made in Minsk, as part of the overall peace deal because the Ukraine leadership would not ever admit that a large formation of their troops had been surrounded. 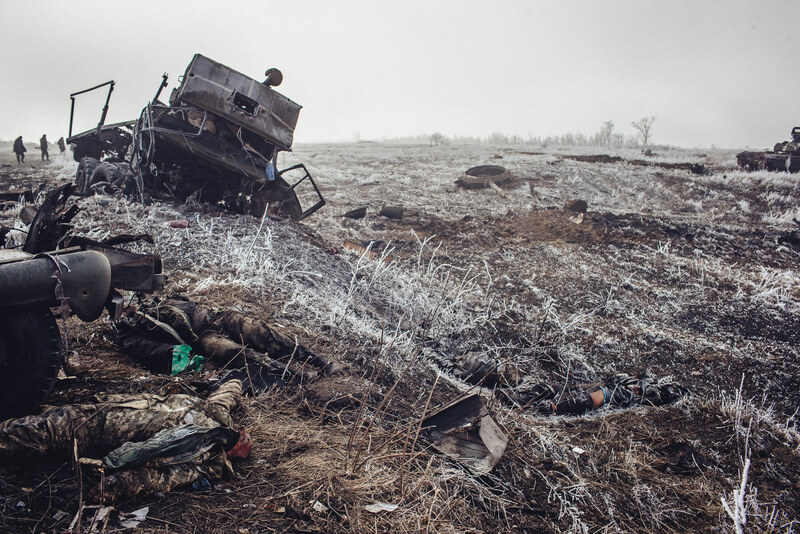 The whole situation is a replay of the Ilovaisk nightmare of August 2014. The Novorussians had taken it and were poised to deliver the coup de grace and the Ukraine leadership would not make a deal for their people because of their pride and many died as a direct result. The latest catastrophic defeat for the Ukraine Government forces means that the Novorussian Republics have achieved their objectives and their hold on the Donbass has survived everything that the Western backed Kiev puppet government has been able to throw at them since the Donbass conflict began in the first half of 2014. The people of the Donbass region and the Ukraine military have each paid a high human price for the futile Kiev attempts to dislodge them and it can only be hoped that the illusions will be wiped from the eyes of the Kiev government and their Western backers and they will assimilate the fact that Russia has chosen to impose neutrality upon the Ukraine and that Russia has the military and political assets to achieve this and there is nothing the likes of Samantha Power, Victoria Nuland or any of the other deluded ideologues of the State Department nor the warmongers John McCain and Lindsay Graham in the US Senate can do about it. 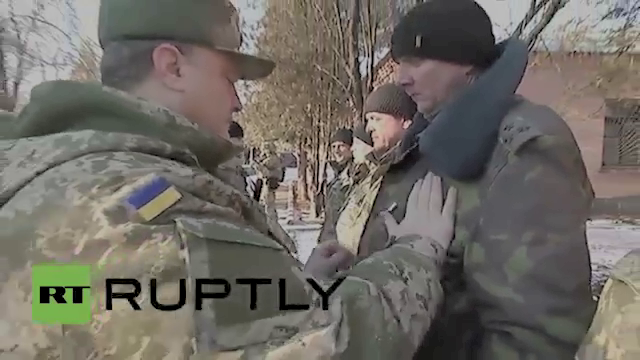 When all else fails… Ukraine President Poroshenko pins the Medal of Ukraine on the chest of theColonel Sergey Chaptal commander of the 128th brigade. Massive Suffering in the Donbass region. The Official death toll from the War is listed as more than 5500 dead. The official refugee tally is at around one million people. The majority of whom have fled to Russia, which says a lot about their perceptions of the war and the Ukrainian state under junta control. The extent of the Military casualties on each side in the war are rather unclear, but it is very clear that since August 2014 the Novorussian forces have defeated the Ukraine Government forces at every turn. Ukraine Government threw their men away in the hope of NATO rescue. The treatment of the Ukraine forces by the Kiev junta has been quite disgraceful. Once it became clear that large scale NATO support would not be forthcoming, that Ukraine was powerless to stop the transferral of weapons from Russia to the Donbass region and the Ukraine military were facing a better trained and equipped force than the Ukraine government forces the Kiev government needed to accept this and call a halt to hostilities. Instead they continued throwing their people away in the futile hope that if the Ukraine Government and their Western handlers complained long enough about the Russian support for the Eastern Republics the West would deliver the Ukraine the support required for them to prevail militarily. Poroshenko literally seems to have been sending his soldiers out to get killed in the hope that their deaths would push the propaganda effort over the line and the West would magically step in and save the situation. 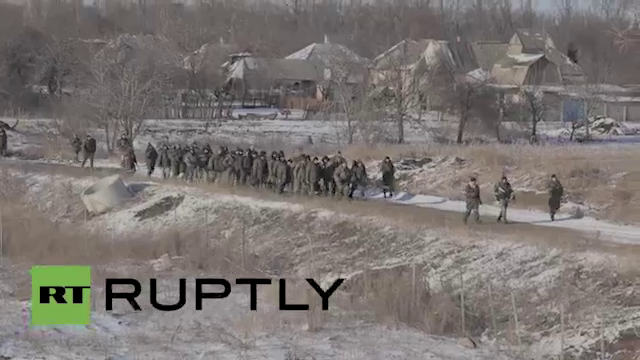 The end in Debaltseve for a surrendered group of Ukraine soldiers. Some surrendered, many escaped, many died, how many are in each category is unclear at this stage. The hubristic and deluded actions of the US State Department and their lackeys bear overwhelming responsibility for this war and the suffering of the people of the Donbass region. The engineered coup in February 2014 that sought to violently drag the Ukraine into the Western orbit and on the path to NATO membership has backfired, badly. The US officials who are the real authors of the Donbass war will of course never for a second admit responsibility nor acknowledge the consequences of their actions. It is not their way. 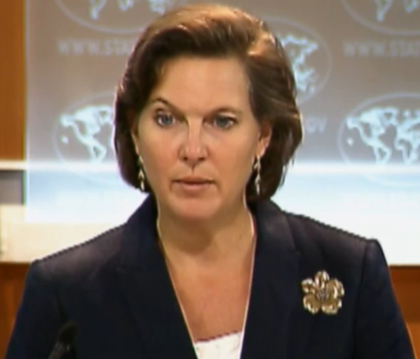 Victoria Nuland one of the Key State Department Officials behind the coup. 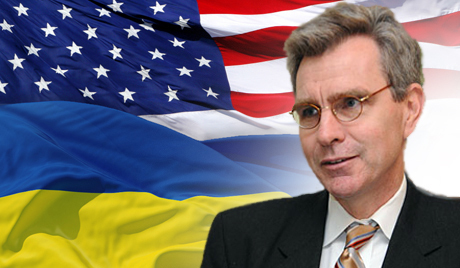 Geoffrey Pyatt the US ambassador, will try and keep the war going in line with Neocon precepts regarding inventing reality. An honest portrait would actually show him with an IMF flag, as that is where the real loyalties lie it seems. The Americans will all walk away from the catastrophe they engineered but the fates will not be so kind to the Ukraine leadership. In the days and months to come there will be a terrible reckoning I expect for the likes of Poroshenko and Yatseniuk and no Medals will ever compensate for the losses they have inflicted on their own Military so needlessly. Some planned withdrawal! 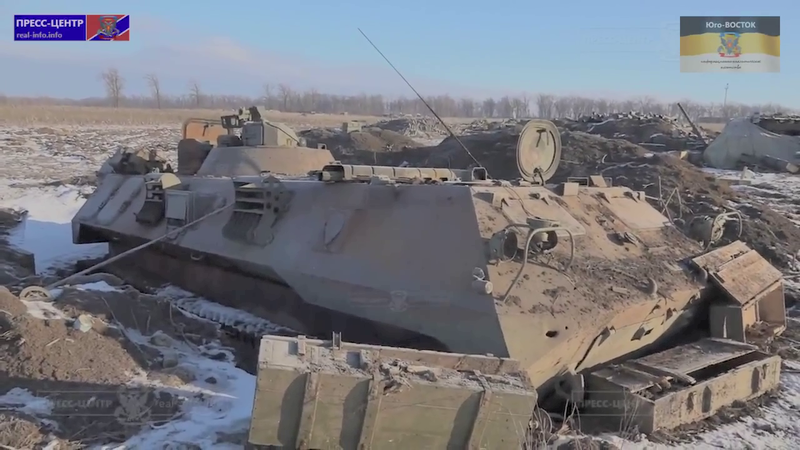 Equipment left behind by the Ukraine 128th brigade. My FDL | Blog | January 29th – Ukrainian Commanding General admits there is no Russian invasion of Ukraine. ← EuroTerror: the Zionist Attempt to Chase the Jews from Europe?